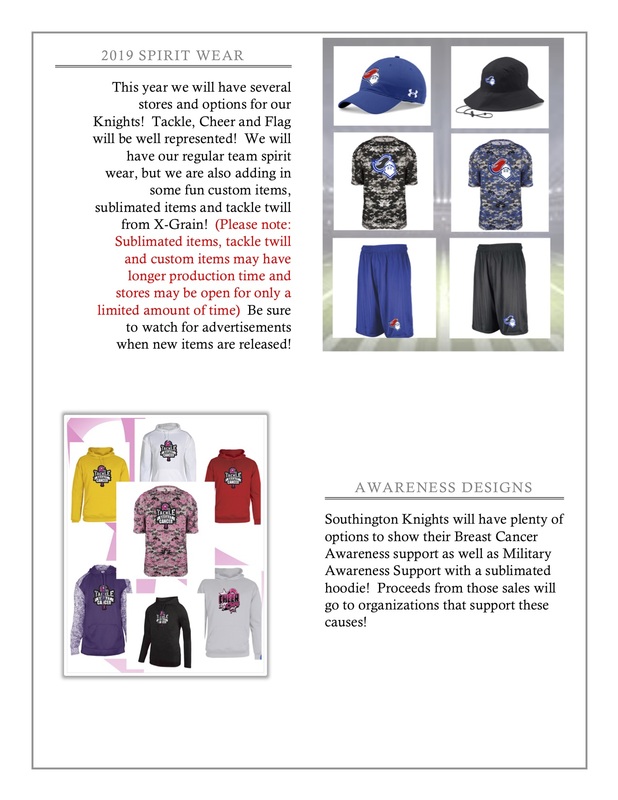 2019 SPIRIT WEAR STORES NOW OPEN! 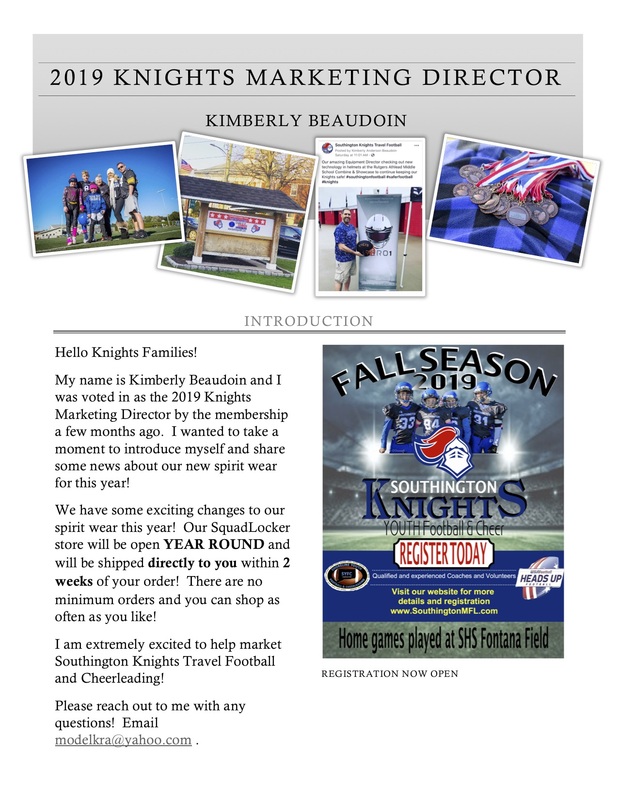 Registration for Southington Knights Cheerleading opens April 1st, 2019! Practices are held Saturday mornings for 6 weeks beginning in early September. Cheerleaders will cheer with the older cheerleaders at a tackle game in October. Practices begin end of July and are held 3-4 nights per week until school starts, then will be held one night per week after school starts until mid September. Cheerleaders will cheer at tackle football games on Sunday through playoffs in early November. Some travel to away games possible. Practices begin end of July and are held 3-4 nights per week until school starts, then will be held 2-3 nights per week once school starts. Cheerleaders will cheer at tackle football games on Sunday through playoffs in early October. All practices and games are mandatory. The Exhibition team will perform at our Local & possibly State Competitions in October/November. Must have 14 girls register to make a team. Must be 8 years old by July 31st of the current season up to age 14 (before July 31st of current season). Practices begin end of July and are held 4 nights per week until school starts, then will be held 3 nights per week once school starts. The Competition Team is a major commitment. Cheerleaders are required to cheer at tackle football games on Sunday through playoffs in early November. The Competition team will compete at our Local & State Competitions in October/November. If they qualify, they will also compete at the New England Regional Competition in November. If they place 1st, 2nd or 3rd at Regionals, they will advance to the AYC National Championship in Florida in December. Competition cheerleaders will participate in fundraisers throughout the season to raise money for travel to Florida. They will also participate in camps & clinics in addition to regular practices. Cost $195 if you register & pay by April 3oth. After April 30th, cost increases to $225. Practices during the summer will be held at Memorial Park on the football and baseball fields. After school starts, practices will be held indoors at one of the Southington Schools. Exhibition and Competition cheerleaders will be required to attend practices at a cheer/gymnastics gym at least once per week. The Sideline, Exhibition and Competition cheerleaders will need to purchase a sneaker package in late July/early August that consists of white cheer sneakers, boyshorts, and 2 hairbows. The cost for the sneaker package is approximately $90. We will have a sizing day at the field house & will fit all of the girls, then the order will be placed through the league. Competition tickets will be need to be purchased by cheerleaders families. Competition cheerleaders/families will be responsible for all costs related to travel & lodging for Regionals & Nationals. A parent will be required to travel to Florida with their cheerleader. As mentioned above, fundraisers will be offered to offset costs. Average cost for parent & child to go to Nationals is approximately $1200. Uniforms and pom-poms are loaned by the league to all cheerleaders and must be returned in their prior condition. 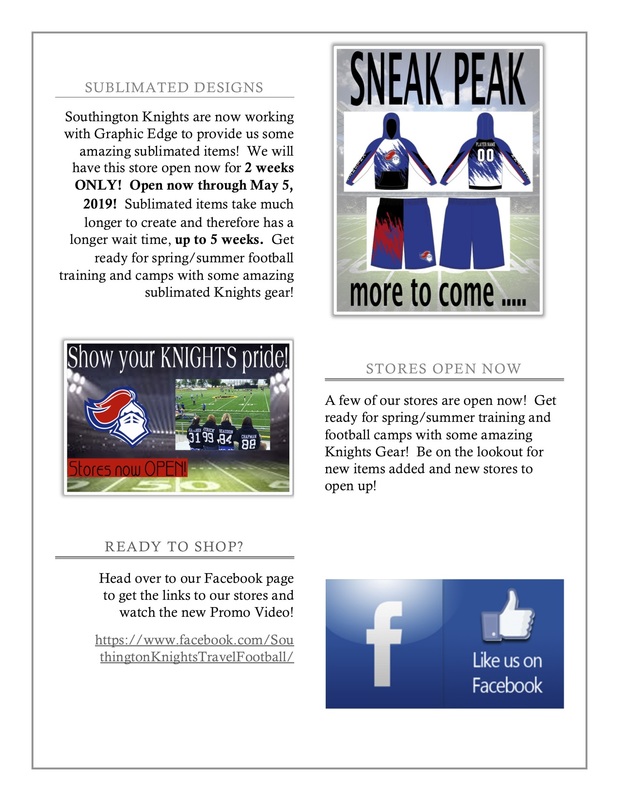 Warm-ups and other Knights Cheer apparel will be offered for purchase. We are proud to announce the recent investments we have made to ensure our league is providing its players and families with the safest tackle & cheer experience. Please visit our "Safety & USA Heads Up" Section for more information on how we are making this a better, safer game!! 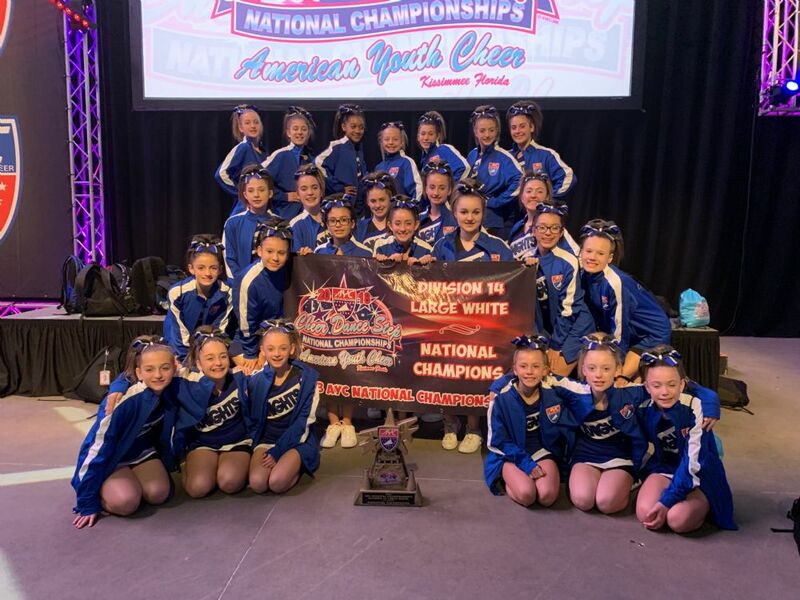 Congratulations to our Division 14 team and their coaches on their National title at the 2018 American Youth Cheer National Championship that was held in Kissimmee, Florida. The girls battled their way through the Local, State and Regional competitions to earn the right to compete at Nationals for the 4th year in a row. This is Southington's first National title! Congrats to all involved!! !